Marissa Farrar: New Release! 'The Vagrant' by Bryan Hall, 'A Southern Hauntings Saga'! New Release! 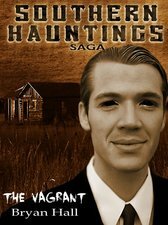 'The Vagrant' by Bryan Hall, 'A Southern Hauntings Saga'! This week has seen a new release from Angelic Knight Press and is available to buy from Amazon! Creighton Northgate is a man shrouded in mystery and on the run from a past he doesn't even fully understand. Blurring the lines between vagabond, enigma, drunkard, and savior, he spends his days staring into the southern legends and paranormal events that most only speak of in hushed, half-believing whispers. In the midst of a sweltering southern day, he attempts to help a homeless man who seems to share his curse; a man haunted by a silent figure from beyond this world who pursues his every step. By the end of the day, Crate discovers that some things are best left alone; some truths best left in the dark. This novellette serves as an introduction to the Southern Hauntings Saga and its central character Crate Northgate, a man whose shadowy past is slowly catching up to him. The first novella in the series will be released late summer 2012. Bryan Hall is a fiction writer living in a one hundred year old farmhouse deep in the mountains of North Carolina with his wife and three children. Growing up in the Appalachias, he's soaked up decades of fact and fiction from the area, bits and pieces of which usually weave their way into his writing whether he realizes it at the time or not. I just bought this a couple days ago. Started it today and almost finished. Can't wait to do review and will read anything this author writes. I was happy to learn that I would soon be able to read more about Crate. Great name, by the way, and great story. Finished. A truly creepy book. Got me thinking. Thanks Laura! I've got a copy as well, though I've not started it yet. MY TBR list so far too long! I've been hearing great things about Bryan Hall though, so I'm looking forward to getting round to reading it!